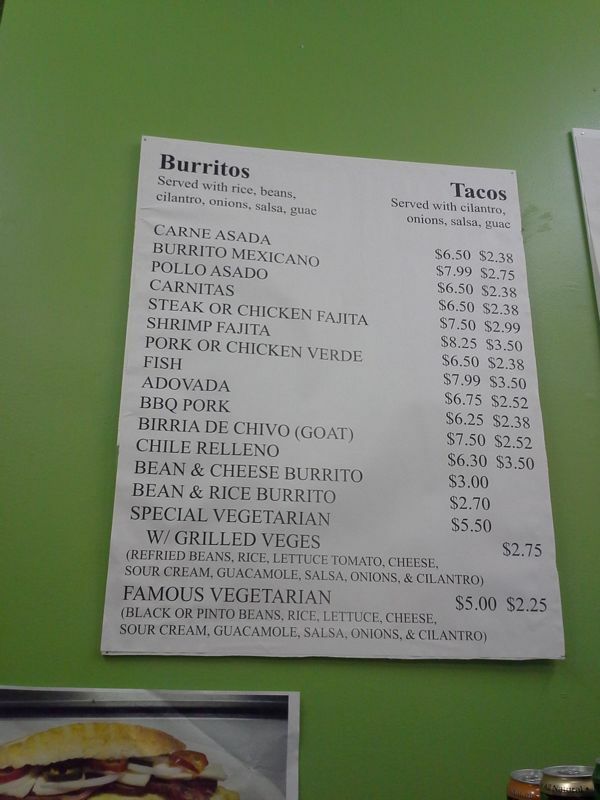 I’m fairly certain I may be the only person ever to order a goat and vegetarian taco in a single order. Sure, I cannot be certain of this fact; however, the sheer juxtaposition of the two tacos alone was an interesting jolt for my taste buds and stomach. Coming back from a long weekend in northern California our family decided to take a more scenic route back to Los Angeles. The Pacific Coast Highway, aka PCH, is a beautiful drive consisting of Monterey, Carmel, San Luis Obispo, and Santa Barbara. 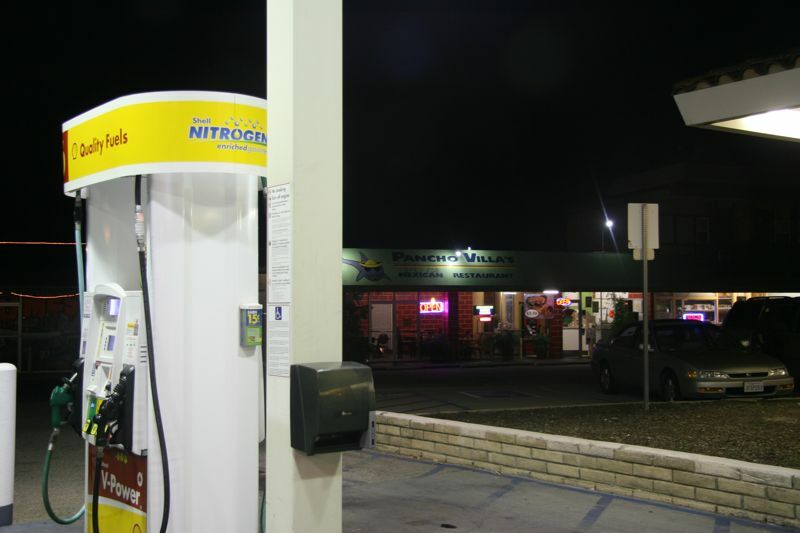 Around dinner time we made a stop for gas at a Shell station in San Luis Obispo and to my surprise there was a taqueria in the strip mall sharing the driveway of the Shell station. Pancho Villa’s is listed as a seafood restaurant on Foursquare and while it does offer several seafood options, it is a taqueria with tacos and burritos as the primary options. 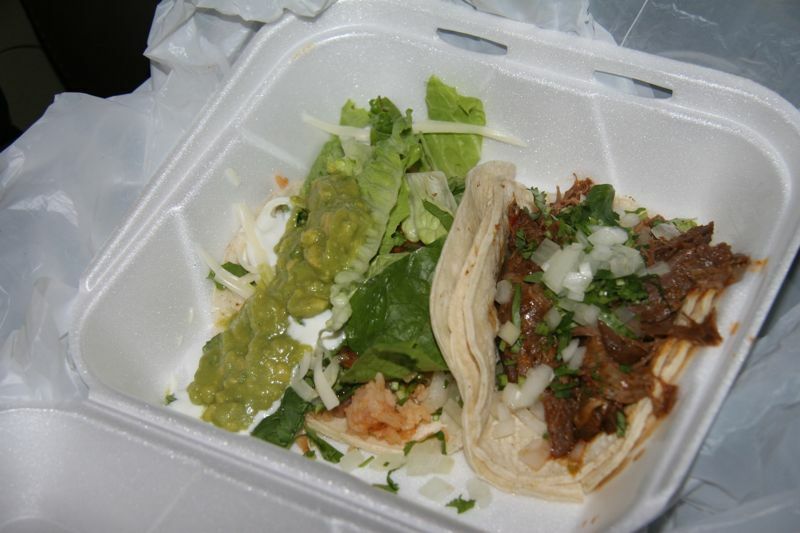 There are 14 choices for your taco here – everything from the traditional carne asada, carnitas, and chicken to a few vegetarian choices including avocado, grilled vegetables, or their “Famous Vegetarian.” There are also chile relleno and seafood tacos. I went with the Famous Vegetarian, which consisted of white rice and mixture of beans with a strip of lettuce, some pico de gallo, sour cream, and a massive amount of guacamole. The taco basically tasted like scooping out copious amounts of guacamole into a tortilla and that’s after scraping some of the guacamole off the top. The filling wasn’t too great either with the rice and bean mixture lacking any flavor. I’m not sure what this taco is famous for, but it’s definitely not taste. Next I tried the birria de chivo (goat) taco. I’ve only had a couple goat tacos and I have to say this made up for the disappointment of the veggie taco. The goat was nicely prepared. It was mostly lean too and I had it ordered only with cilantro and onions. The hot red sauce they had at their salsa bar also added some welcomed flavor to round out one the best goat tacos I’ve had. With 12 other choices to try, I’m sure there are some other winners and losers on the menu. Perhaps some other drive along the coast will present itself so I can have a go at their chile relleno taco and maybe a shrimp taco too. I’m hoping the shrimp taco is a winner as I’d hate to have that sitting with me on a three-hour drive back home. I live two blocks away, so I can tell you with reivltae certainty: It’s only here on Friday and Saturday nights. I think I’ve also seen it at last thursday. It appears to be one of the elusive few mobile food carts.